Swan Symbolism, with the meaning of Swan Spirit Animal & Swan Totem Powers . . . The Swan exudes the essence of angels, imparts divine healing words and energies, reminder of the possibility of transformation; of something or someone into something beautiful to behold. . .
Swan Symbolism. 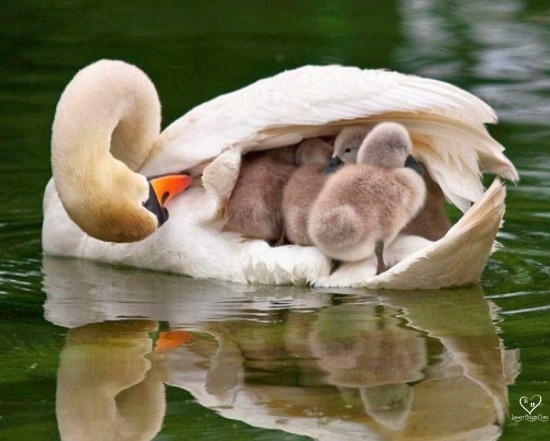 . . "In the most effortless way the Swan spirit animal signifies spiritual devotion and exudes the presence of angels. Drifting on the calm waters of a pond the Swan always seems to be surrounded by a soft golden glow offering deep peace and inner healing. In the moment of first seeing a Swan, our breath slows down as we gaze upon her beauty and elegance. A message from an angel is awaiting you, offering precisely the wisdom and guidance you need at the moment". When the Swan appears for you it is a clear sign to slow down and drop into the presence of the moment. Let go and just allow, knowing that all is well and you are being guided even if it doesn't seem so. The Swan spirit animal has shown itself to you intentionally. This is a time of graceful healing of things that have been hard to let go of. The Swan is here with messages and healing for your heart and soul. The golden glow surrounding the Swan is the light of the ethereal realm, the residual light the angels travel by. The Swan invites you to lovingly let go of all that no longer serves you. The pain that has brought you to this moment has taught you well, it is time to see the situation in a new light, a light filled with wisdom, knowing that your soul has grown immensely and you are stronger than you know. The golden glow surrounding the Swan is filled with healing energies. Be still, watch the Swan, her movements have lessons to teach. Lessons of acceptance and letting go, lessons of surrender. Surrender to what is to find the healing you need. The Swan appears to show you yourself in a new light, in the way that the angels see you. In the presence of the Swan you are reminded that you are a child of the Divine. You are a spiritual being on a journey in the physical world. The Swan is the diviner of healing energies. Speak to the Swan spirit animal and ask her to guide you to the healing that you need, ask her to transform herself into her higher self ~ an angel. If you are strongly drawn to the Swans or Swan Symbolism you are a healer, you want to heal others and to bring blessings of hope and healing in many ways. The Swan appears for you as a healer to let you know that your presence is very healing in your work. If you are calm and connected to your source you too will have the divine glow which offers transformational healing to all those in your midst, you have an ability to have "healing hands" with your gentle and spiritual touch. You can channel the messages of the angels and bring extraordinary healing to the hearts of many. Be sure to remain humble and grateful for your spiritual gifts. When all intentions are benevolent on your behalf, you will carry the energy of an "earth angel", many will be drawn to you for this spiritual essence. Others want to be near you and to seek your words of hope and inspiration as they have healing energies of their own. Be conscious of your words, be soft with your eyes. When you have fully come into your spiritual self you will be filled with grace, knowing that you are doing the work that fills your soul and opens new doors in the spiritual planes. Your satisfaction will come in doing the work, knowing that your love helps to heal the world and ripples far beyond where you will ever know. See the Polar Bear for a powerful lesson on acceptance and surrender. You may have had an extraordinary life experience which caused a remarkable transformation. You may have transformed from an ugly duckling into the swan. You have built inner beauty that now is the outer beauty of your being. If this is so, you draw your strength from your inner beauty, for that is the beauty of the soul.